How can I improve the water pressure in my shower? I recently purchased my first home. It has two bathrooms and the water pressure in both is less than ideal. What are some steps I can take to increase the pressure? This is an effective trick a plumbing contractor once told me. Go to your local home improvement store and buy a cheap shower head (the one I picked up cost $1.50). If you look down inside of the showerhead you'll see a washer which constricts the water flow. If you take a drill and enlarge the hole, thereby increasing flow, the water pressure will increase. I didn't think it would work but it did!! If you want to go the expensive route, there are pumps you can purchase that will attach to the piping and add pressure to the water. I've heard of such a thing but never looked for one. In the U.S., shower heads are required by government regulation to restrict water flow in order to save water and energy. By law, they must deliver less than 2.5 gallons per minute. For this reason, many shower heads will deliver less than ideal flow and/or pressure. To get around the law, and benefit those with less-than-stellar water pressure, many showerheads (e.g., the Waterpik I recently bought) come with instructions for removing the flow regulator. If you've discarded those instructions, a quick Google search should be all you need to figure out how to remove the flow regulator in your shower head. Low pressure can be caused by old galvanized pipe, which often build up deposits causing the water to be restricted. Another cause of low pressure can be incorrect pipe size. I like to run a 3/4" trunk line with 1/2" legs to fixtures (which I think is pretty common). 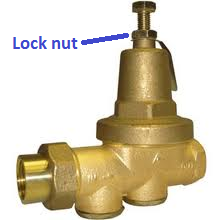 Some houses have pressure reducing valves on the supply line, which are used to control the water pressure inside the house. Here's a video explaining how to adjust this valve. Start by loosening the lock nut. Next turn the adjustment screw. Turn the screw Clockwise to increase the pressure. Turn the screw Anticlockwise to decrease the pressure. Once the proper pressure is set, tighten the lock nut. These answers all assume the pressure is low in the whole house. If it's just the shower see the other answers. Is it the water pressure for the whole bathroom, or just the shower that's sub-par? Before I bought a house, my last apartment had really poor pressure in the shower, but the bathtub faucet was fine. I removed the shower head to see if that was the cause, and sure enough, there was plenty of water pressure in the shower, it was just the cheapo shower head that the apartment had installed. I bought a Waterpik and it solved everything. Every Lowe's or Home Depot and other places like that have a shower head that looks something like this and I find I get a much more satisfactory result when I have low water pressure. It's just got a concentrated, small diameter of holes, and solid brass insides. They tend to run anywhere from 4-12 bucks depending on where you go and what brand is available in that store at that moment. Anyway, while they don't increase the flow, and they don't increase the pressure, they seem to at least concentrate the flow and improve the experience, and you don't need to alter them. Nearly all shower heads sold in the USA are fitted with self adjusting pressure regulators manufactured by one company. The purpose of the regulator is to maintain a constant flow of water exiting the shower head regardless of the pressure entering it (30-80 psi). The problem with their design is that the regulators easily plug up with solids in the water. When they clog up, the pressure and the flow rate entering the shower head are reduced and the resulting spray is weak. This will happen regardless of the pressure upstream of the regulator, so raising the water pressure entering the home will probably not affect the performance of the shower head. 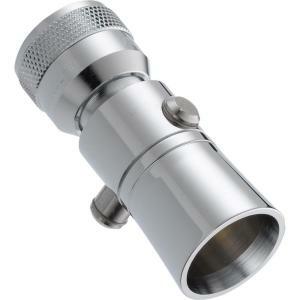 In addition, the regulators are always found inside the shower heads and are nearly impossible to reach for cleaning. The solution is to find a shower head that will not clog up and will deliver a full, strong spray over a long period of time. I know a little about shower heads, as I am the founder and manufacturer of a very unique shower head. Or you might need to drill a bigger hole in the water inlet of the shower head (which I've done on larger shower heads). Even if you hack the shower head itself, your flow rate might be limited by the piping / valve of the shower itself (cf. this video). Also, in the U.S., it's federal law that shower heads must be rated < 2½ gallons per minute! See Jeff Tucker's Hack Your Showerhead: Or How to Get the Government Out of Your Home and article. If you have well water, the pressure in the holding tank may not be correct. The cut in and cut out pressures may need to be calibrated. 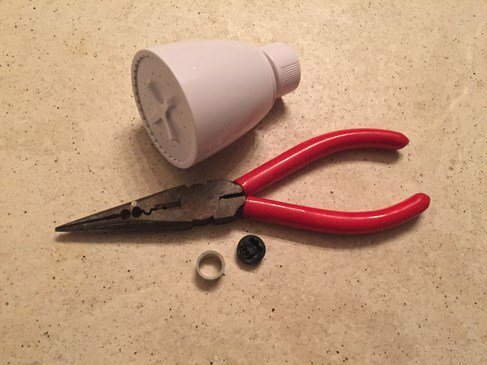 Try the trick that was mentiond about widening the plastic hold in shower head this also works for the airators in sink fauset if it doesn't help then consider replacing the shower body. If its only in the bathroom if it's the hold house then check water heater and or boiler psi. Not the answer you're looking for? Browse other questions tagged plumbing shower water-pressure or ask your own question. Why is my downstairs shower pressure lower than upstairs? How can I increase water pressure after installing dual-head shower? How can I fix low water pressure in one shower? Why is my shower head pressure low? How do I increase the water pressure in my shower in spite of water-saving hardware?